This new miniseries from Dark Horse Comics could use more substance, but it looks damn good. 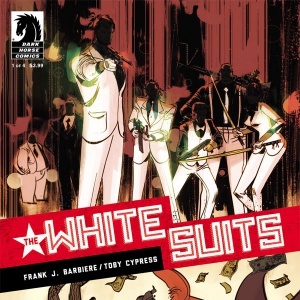 It's not often that prioritizing style over substance is a good thing, but that is mostly case with The White Suits, a new Dark Horse miniseries by writer Frank J. Barbiere and artist Toby Cypress. The White Suits, the story goes, were an anonymous group of killers who terrorized the Russian criminal underworld back during the Cold War. Mysteriously disappearing years ago, as the issue begins they've reappeared in modern day New York City where they're cutting a swath through local mobsters without mercy. This sets in motion an attempt by gangsters to unify in response to this new threat that doesn't go very well, but the series is driven by the mystery of just who these people are, and the efforts of an FBI agent to solve it. If it sounds familiar, it should. Definitely taking a cue from early Frank MIller or Brian Michael Bendis, Barbiere's story beats are half-pure potboiler and half-action movie. A pulp world populated solely by ruthless killers and worn out cops is hard to get right, and Barbiere thankfully nails it. It's very minimal, with most lines of dialogue essentially profanities and general exasperation at the brutal effectiveness of the titular killers, or the jaded narration of what looks to be the series' protagonist providing some, though not very much, context for the beautifully rendered scenes of criminal mayhem. Hell, if nothing else, it feels like an attempt to make a graphical version of airport novels like the Jack Reacher series. It mostly works, though the minimalism does leave the reader feeling a bit underfed. Ultimately, the first issue of The White Suits is almost entirely prologue, ending at the actual beginning of the story. You're left with the feeling that you've just read the pitch for what you're certain sounds like an excellent series. That could be a serious problem for a four-issue mini series. Issue two had better be far meatier, or this is going to end up going nowhere. Still, half-formed or not, it starts off with a bang, and ends on a high note, and I, at least, was left somewhat voracious to know what happens next. Even if I think I can already guess. Fortunately, Cypress' highly stylized art, which calls to mind 1960s film posters and pulp comics from the 1950s, gives readers something strong to latch onto while waiting for the story to pick up. Rendered mostly in black and white, with vibrant splashes of red during particularly intense moments, it has a choppy, cinematic style well suited to the material. Characters are drawn in a surreal way that, oddly enough, made me think of Daniel Clowes' early work, scenes within panels are frequently drawn at canted angles, and the violence often happens just out of view, ramping up the already high tension. At times, The White Suits has an air of almost trippy disjointedness, and if at some point we get a binge montage straight out of Reefer Madness, I wouldn't be surprised, or disappointed. It might not be for everyone, and even for its target audience it's going to require a bit of a pilot-episode pass. It might even be best read once issue #2 is released and you have more to experience than setup. But the rum-soaked script and striking visuals show plenty of promise. I have feeling The White Suits is definitely going to grow into its own - I'm at least going to stick with it to see for myself. Bottom Line: It's not a perfect first installment, lacking density needed to propel a rather short series along. But when it works it really works. Fans of crime fiction and spy fiction at least get to start the meal with a tasty snack, and the surreal, cinematic visuals are impressive. Recommendation: Pick it up, but maybe wait until just before issue #2 comes out.